AccuRing series direct-drive rotary tables (DDR) provide superior angular positioning and velocity control with exceptionally large apertures. Large aperture rotary tables with zero backlash, and no gear wear or gear vibration are now available. Direct drive AccuRings are significantly faster than worm and gear drives. System accuracy and repeatability of the stage will be maintained over time. Higher accuracy and no backlash allow customers to produce more accurate and consistent products. Applications for the AccuRings rotary tables include single and multi-axis laser testing, antenna testing, inertial navigation device testing, photonic component alignment, high-accuracy laser machining and precision wafer inspection. These rotary stages can also be configured as multi-axis gimbals. Conventional transmission based rotary tables with similar apertures and payload capacity operate only to 10 rpm or less. 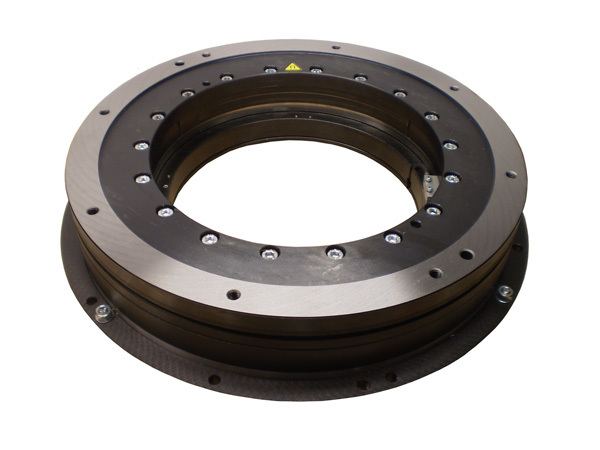 AccuRing direct-drive stages have been tested to 300 rpm continuous rotation. Angular contact bearings are used to maximize performance with respect to wobble, moment stiffness, and rotating friction. A precision-machined rotating shaft further minimizes wobble. To maximize positioning performance, AccuRing Series direct-drive rotary tables utilizes brushless modular RotoLinear motor technology. This motor has all of the advantages of a brushless direct drive motor – no brushes to wear, no gear trains to maintain, and high acceleration and high speeds. This makes the AccuRings ideal for the applications requiring contoured motion, smooth scan velocity and precise incremental steps. Performance is assured with encoder resolutions up to 0.18 arc sec. The motor and ring encoder are directly coupled to a rotating shaft. The absence of gear trains and mechanical couplings eliminates position errors caused by hysteresis, windup or backlash. As a result, accuracy of ±5 arc sec and bi-directional repeatability of ±0.5 arc sec are attainable.